My time in central Scotland was amazing. I was mesmerized by this land of ancient castles under these billowing clouds and powder blue skies with shafts of golden light shimmering onto lochs and emerald rolling hills. 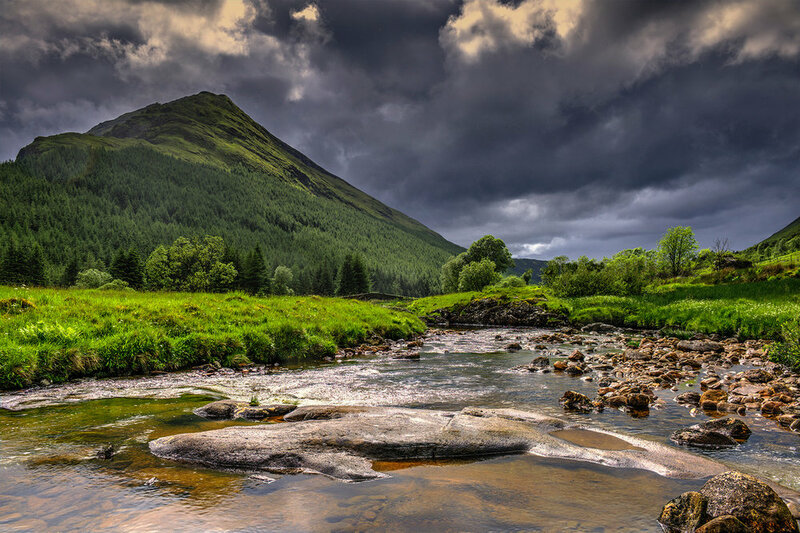 From the wild marshlands to the rugged mountain peaks, Scotland is home to some of the most jaw-dropping landscapes in the UK. My trip to Scotland was very authentic. I traveled in early June with 10 photographers. We stayed at the Ford House in the small village of Ford, at the southern end of Loch Awe near the Kilmartin Glen. Built in 1864 as a Victorian sporting hostelry, it had been renovated and converted into a bed-and-breakfast. And this house had all of the charm that you would expect in a 150 year old Scottish house. The house sat in the middle of no where. No phone signal. Wifi only. In fact not even the locals could get phone service. And the people who ran the Ford House were remarkable, Craig and Inge, who took care of us and who cooked the most amazing food everyday – I’ll get to that later. Outside its stunning beauty, there were several things that struck me about Scotland. One was the length of the days. Our days were very long in Scotland. 17+ hours of daylight. We would return after a long day of shooting and as the evening fell into night – I noticed that it was never quite dark. Even at midnight there was still some twinkling light in the night sky. The other thing that struck me was the weather. You really have to be prepared for any type of weather while photographing in Scotland. It could be sunny with blue skies one minute and without warning suddenly turn windy with rain. Having rain gear for yourself and your camera is a must because there is always rain. If not a downpour – a constant mist. I am convinced that there is definitely a relationship between Scotland’s weather - the unique mix of sunshine, wind and rain – and the awe-inspiring Scottish landscape - where there seems to be 50 shades of green on the countryside. Green like I’ve never seen before. Scotland is known as the land of the castles and it did not disappoint. We photographed Carnasserie Castle, a 16th century tower house on Kilmartin Glen. Kilchurn Castle which sits on a small peninsula at the northern end of Loch Awe. This castle was built about 1450 and the rolling hills and landscapes in this area created some of the most epic photographs. Scotland is definitely a favorite place for motion picture Location Scouts because many of the places we photographed were familiar as they were also film locations. We visited the famous Highlands where we spent time shooting Glen Etive. Glen Etive appeared in James Bond’s “Skyfall” and in Mel Gibson’s “Braveheart.” We took a ferry to Isle of Mull and photographed the famous Duarte Castle, also seen in “Skyfall.” We visited Castle Stalker from “Monty Python and the Holy Grail." We photographed the famous Glenfinnan Viaduct which carried the Harry Potter train. We photographed the iconic Eilean Donan Castle, the most photographed castle in Scotland. And ended the trip at what most people say is the most beautiful place in Scotland – Glen Coe - with its breathtaking rivers, warterfalls and mountains. While in Scotland I was lucky enough to see some truly spectacular scenery - but outside photographing - I also wanted to immerse myself in the culture - which I try to do during all of my travels. And this, of course, started with the food. I did my best to eat as much Scottish food as possible. And every morning, our Innkeepers, Craig and Inge, would cook us the most amazing breakfast. I fell in love with the sausage rolls and the Scottish eggs and smoked salmon. Some mornings I would even have the proper Scottish Breakfast – the Fry-Up - which consisted of toast, Scottish eggs, beans, blood sausage, bacon, some sort of leftover mashed potatoes mixed with flour to make a flat bread, mushroom caps and tomatoes and tea and milk. Then there was the famed haggis or the incredible chicken and stuffing sandwich - which I literally ate everyday. I obviously fell in love with Scotland and all that makes it unique from the bag pipes to the men in kilts to the Scottish accents to the pesky midges to the furry cows to the dramatic landscapes and scenery, which are some of the most beautiful I have witnessed anywhere in the world. However what got me at "go" was the people. The people of Scotland are some of the nicest, most generous and spirited people that I have met anywhere in the world. Once I arrived in this beautiful land I knew that I would not leave Scotland unaffected!